Name of a king of Elam (Gen. xiv. 1), who made conquests as far west as Canaan and exercised supremacy over its southeastern part. After paying tribute to him for twelve years, the five local kings, or princes, rebelled in the thirteenth year, and in the fourteenth were assailed and reduced by Chedorlaomer, assisted by Amraphel, King of Shinar; Aroich, King of Ellasar, and Tidal, King of Goyim. 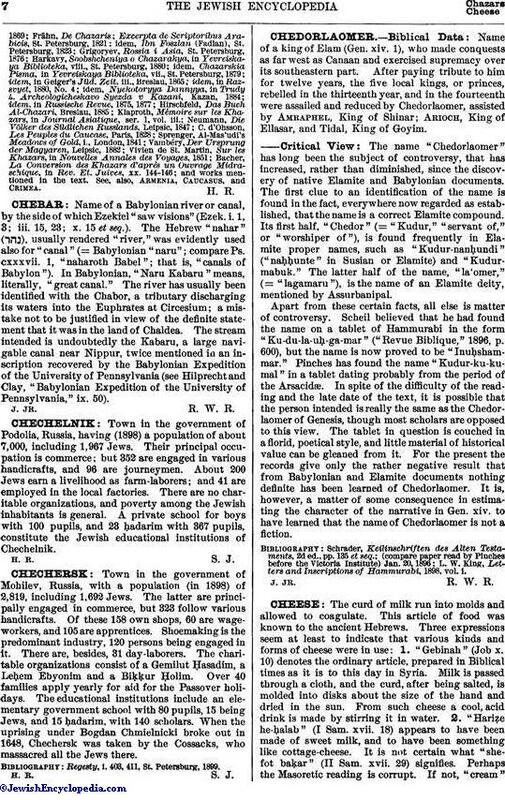 The name "Chedorlaomer" has long been the subject of controversy, that has increased, rather than diminished, since the discovery of native Elamite and Babylonian documents. The first clue to an identification of the name is found in the fact, everywhere now regarded as established, that the name is a correct Elamite compound. Its first half, "Chedor" (= "Kudur," "servant of," or "worshiper of"), is found frequently in Elamite proper names, such as "Kudur-nanḥundi" ("naḥunte" in Susian or Elamite) and "Kudurmabuk." The latter half of the name, "la'omer," (= "lagamaru"), is the name of an Elamite deity, mentioned by Assurbanipal. Apart from these certain facts, all else is matter of controversy. Scheil believed that he had found the name on a tablet of Hammurabi in the form "Ku-du-la-uḥ-ga-mar" ("Revue Biblique," 1896, p. 600), but the name is now proved to be "Inuḥshammar." Pinches has found the name "Kudur-ku-kumal" in a tablet dating probably from the period of the Arsacidæ. In spite of the difficulty of the reading and the late date of the text, it is possible that the person intended is really the same as the Chedorlaomer of Genesis, though most scholars are opposed to this view. The tablet in question is couched in a florid, poetical style, and little material of historical value can be gleaned from it. For the present the records give only the rather negative result that from Babylonian and Elamite documents nothing definite has been learned of Chedorlaomer. It is, however, a matter of some consequence in estimating the character of the narrative in Gen. xiv. to have learned that the name of Chedorlaomer is not a fiction. L. W. King, Letters and Inscriptions of Hammurabi, 1898, vol. i.